This sturdy, 4-post steel table is perfect for arts and crafts, hobbies, and all kinds of creative endeavors. It's built tough to provide years of service. Minimaster comes complete with a 24" × 36" Melamine top that includes rounded corners for comfort and safety. 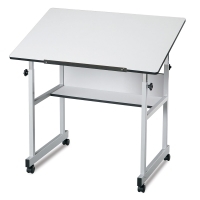 It features sturdy one inch square steel tube construction and a durable powder-coated finish. 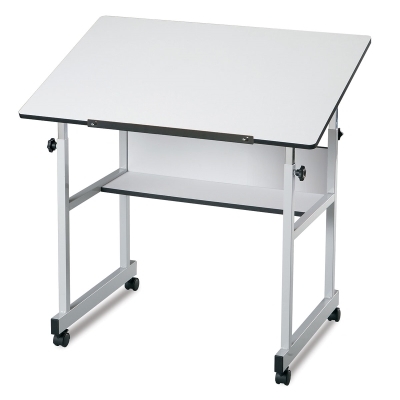 Adjust the table height from 27" to 40" in horizontal position. Adjust the board angle from 0 to 30 degrees. Underneath the table is a built-in 9" × 24" storage shelf with back panel. Floor glides are adjustable for stability. ® Alvin is a registered trademark.® Melamine is a registered trademark.